​Normal Eating. What the heck is that anyway? ​Most people who struggle with any type of food issues, have no idea what it means to be a normal eater. The constant roller coaster of yo-yo dieting, starting over, the next meal plan, the next fad diet; none of this helps ​​support normal eating and ​leads to a whole lotta feelings of failure, frustration, disappointment,​ and exhaustion. 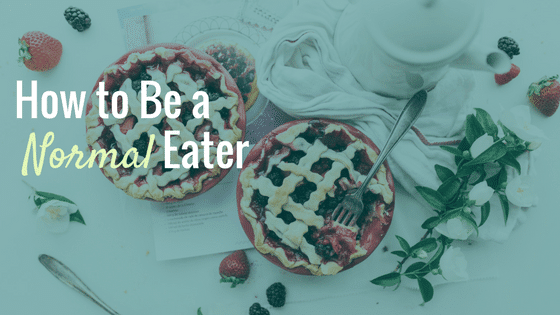 If you do pretty much everything on that list, then it's time for you to learn how to become a normal eater and to let go of the vicious struggle with food, so you can live your life fully and freely. Imagine no more obsessing over what you can and can't eat, how many calories are in something or if that certain food will make you fat? Can you say FREEDOM??? That's what normal eating will give you. ​​Being a normal eater doesn't mean you fly by the seat of your pants. It means that you set yourself up for success so that you have nourishing food available to you. ​If you are here, I know you are someone that cares about eating well, feeling good and ​experiencing optimal health and energy. Prepping ​and loosely planning your meals will set you up for success. I know this may sound like a rule, but it's actually not. It IS meant to help you build a sustainable habit that will support you in nourishing your body. Being healthy takes commitment and alignment, but it doesn't have to be a lot of work. ​It's pretty hard to ​have optimal health and energy, if you are eating out every night, going through the drive thru and eating on the go because you don't have nourishing food available to you. ​​Spend a ​couple hours each week, (yes, just a couple - which is less than what you probably spend wasting time on social media or binge watching Netflix) planning out what yummy, nourishing meals you ​will have for the week​, then schedule in your day to shop and cook. ​Having ​lots of rules with food will also keep you stuck in a vicious cycle. When we are continually labeling foods as "good" or "bad," "healthy" or "unhealthy," we put ourselves into deprivation mode. Those "bad" foods become forbidden, even if we love them. That will surely lead to going off the rails at some point. Whenever we deprive ourselves, the pendulum will swing the other way in order for you to stay in balance. ​I used to have a million rules around food. Now I eat what I want and ENJOY it. When choosing food, make your choice based on what will nourish you and feel good to eat. And then take the time to SAVOR whatever you are eating and make it a positive experience. It's often the judgement we have about the foods we eat, or don't eat that cause most of the suffering. See if you can truly enjoy eating one of your forbidden foods without the judgement. Give yourself permission to enjoy it. As I mentioned in strategy two, it's important to savor the food we are eating. Eating on the go, distracted and at your desk while working is hard on the body and actually puts your body in a physiological state of stress. Next time you eat a meal, sit down, slow down and savor the food. Try this as a daily practice with at least one meal. This will attune you more to your body's hunger and satiety signals. Always be​ing ​distracted while eating will often disconnect us from ou​r hunger, and knowing when we are full. How many times have you shoved something in your mouth without even checking in to see if you were hungry? Make this a regular practice and you will start to understand and see how much less you eat when you just-slow-down, and savor your food. ​Becoming a Normal Eater takes time, practice, patience and consistency. There is no magic pill to change your relationship to food. ​​These are just a few strategies to build a normal way of eating. ​If you start to put these into practice on a daily basis, you will notice small shifts in how you relate to food. ​To learn more on how to become a normal eater, check out the video below to hear my story around normal eating, and the person who modeled it for me in my life.